Following six weeks of massive demonstrations, Algeria's ailing president resigned yesterday after two decades in power. 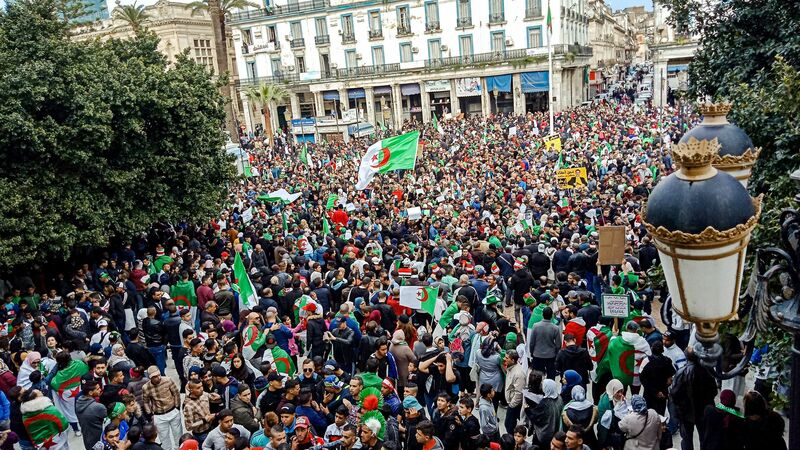 What to watch: While hundreds of thousands of protestors pried open the door, it was Algeria’s top general who finally kicked Abdelaziz Bouteflika out. Gen. Ahmed Gaïd Salah belatedly backed a constitutional process to replace Bouteflika with an interim government until elections can be held (within 90 days). That government is led by members of the old guard who will want to protect the system the protesters set out to topple. The military has powerful interests to protect as well, and may see a power vacuum it can take advantage of. The beginning: "In 1963, shortly after Algerians won their independence from France, Abdelaziz Bouteflika, a charismatic veteran of that war, was named the new nation’s first foreign minister," Washington Post. The middle: "Bouteflika spent nearly 60 years in the public eye, developing a complicated legacy that saw him alternately lauded as a progressive anti-colonialist, exiled for corruption, welcomed home as a peacemaker...."
The end: "The images on Algerian television were telling: A feeble-looking Mr. Bouteflika handing his resignation letter to the elderly president of the country’s constitutional council," NY Times.